Designwest are constantly working alongside Ireland West Airport Knock who are one of our most trusted clients. The brief on this occasion to create some billboard designs for their new advertising campaign. The billboard designs feature their new Brand very heavily and are stylised to suit the new brand – one clever design is created using the shadow of a plane flying over a beach advertising their 20+ destinations worldwide. The other billboard design is a stylish design depicting their new parking scheme again using the brand guidelines as a base for the design. Billboards designs are a great way for any business to advertise because of course everyone uses the roads so an effective Billboard design can truly reach everyone although more expensive and a little bit more hassle to get up they really are a brilliant way to advertise to a wide array of people very quickly. Category: Billboard Design, Avertising Design, Charlestown, Co. Mayo, Ireland. Category: Billboard Design, Promotional Design, Advertising Design, Co. Mayo, Ireland. These billboards are a result of a collaboration between Ireland West Airport and Mayo County Council. Ireland West Airport try to promote our beautiful county to inbound tourists. There are a number of billboards featuring photography of amazing Mayo scenery, showcasing all Mayo has to offer. 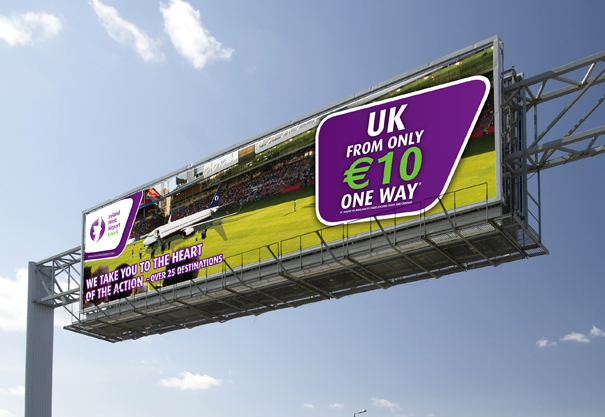 Designwest complete all outdoor advertising for Ireland West Airport. Category: Billboard Design, Advertising Design, Charlestown, Co. Mayo, Ireland. Designwest works extensively with Ireland West Airport Knock, helping to create signage and promotional materials within the airport and beyond. They wanted a fresh new billboard ad campaign for 2012 that would establish the look and feel of ad designs and other marketing collateral throughout the year. Designwest used this opportunity to create a modern and dynamic style for the press ad design while still remaining as faithful as possible to the brand design guidelines for Ireland West Airport Knock. Designwest works extensively with Ireland West Airport Knock, helping to create signage and promotional materials within the airport and beyond. They wanted a fresh new billboard ad campaign for 2012 that would establish the look and feel of ad designs and other marketing collateral throughout the year. Designwest used this opportunity to create a modern and dynamic style for the press ad design while still remaining as faithful as possible to the brand guidelines for Ireland West Airport Knock.